Since they first arrived in the Premiership in 2010, Exeter have continually defied expectations. Rather than take the well-trodden path of perennial relegation candidates that other smaller clubs in the Prem have gone down, Exeter have gone from strength to strength – establishing themselves in the league, flirting with the playoffs, and even winning their first major trophy last season. Their partners throughout their top-flight journey have been Samurai, so let’s take a look at what their offering this season. 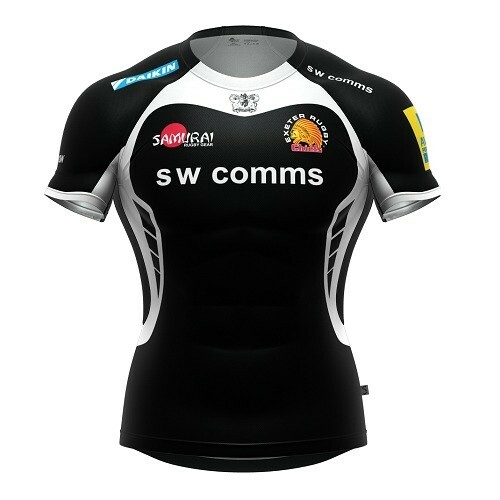 If you remember last season’s Chiefs kit, you’ll notice that er… well nothing’s changed! Yes, the Chiefs have kept things unchanged for 2014, and that’s not a bad thing. There is a new Cup shirt though, which we’ll get to in a minute, but first let’s consider the existing stuff. There’s nothing at all wrong with the home shirt – it’s a completely inoffensive black shirt with some white accents, that aren’t hugely busy or over the top. Our one issue with it is the way they’ve used the white – there’s something about it that just feels a little low rent. 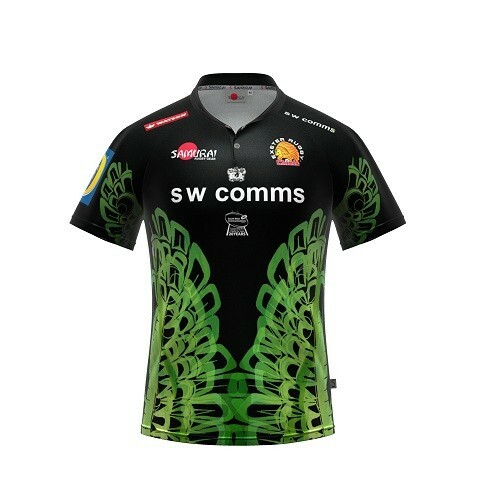 It looks like a design template that you’d buy for your local rugby team, or the kind of ‘almost there’ shirts you get in a sports video game when they haven’t officially licensed your favourite team. A Pro Evo kit, if you will. It’s not that – we’re sure Samurai have given their most high-profile team the full design treatment, and it’s totally bespoke, but there’s just something about it that feels off the peg, and it’s not exactly what you want for your top-flight pro rugby team. The alternate shirt has a similar off-the-peg vibe, but the reduced amount of contrast colour here does diminish the effect, we think. 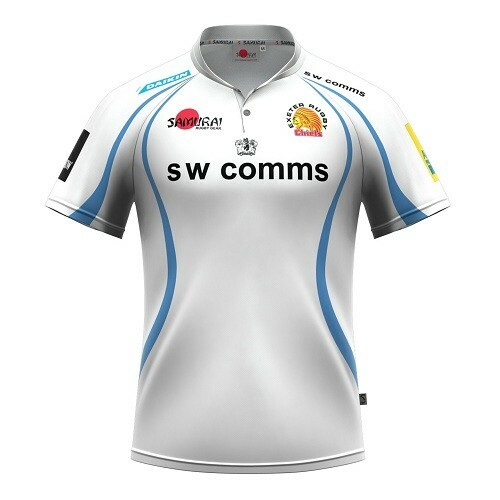 It’s also worth noting that the combination of white with the light blue is really rather nice – it doesn’t really go with the Chiefs’ garishly yellow crest, but you could say the same about the home shirt. It’s quite a thing, isn’t it? We have to say, we are massive, massive fans of the combination of lime, almost day-glo green with black. It’s bold, modern and so eye-catching. It’s also got so much more identity than the home and alternate shirts. By using the pattern borrowed from the Native American headdress of the figure on the Chiefs’ team logo, it’s instantly apparent who this shirt belongs to, and is a proper, bold visual statement about the club’s identity. Now… the issue of that identity is another matter altogether. We’re not going to labour the point, but we’ve long harboured a bit of distaste for the cultural appropriation of the Chiefs’ name and logo. We’re just not entirely sure why a team from Devon needs to borrow the heritage of a racial minority who live thousands of miles away simply because the team was called by that name in the 1930s. For us, the slightly tacky stereotypical ‘Indian’ is a bit unnecessary, and the use of the headdress here emphasises that. But that’s a matter for people who are far above our pay grade – we’re here to talk about shirts. All three of these designs work on some level. The home and alternate shirts are nice, if a little bland, while the cup shirt is a really cool, bold, modern design that certainly catches the eye. Great? No, but sometimes good is enough.